Coach Kiprunning will be represented at this weekend's Novo Nordisk New Jersey Half Marathon. We wish all runners--half and full--the best of luck. I've run both the New Jersey Half and the New Jersey full, and I can say that they are both great courses. They are flat, and if the conditions are right, they can be really fast. It's looking like it might be rainy on Sunday, but if the wind stays down, the wetness shouldn't be too much of an issue. 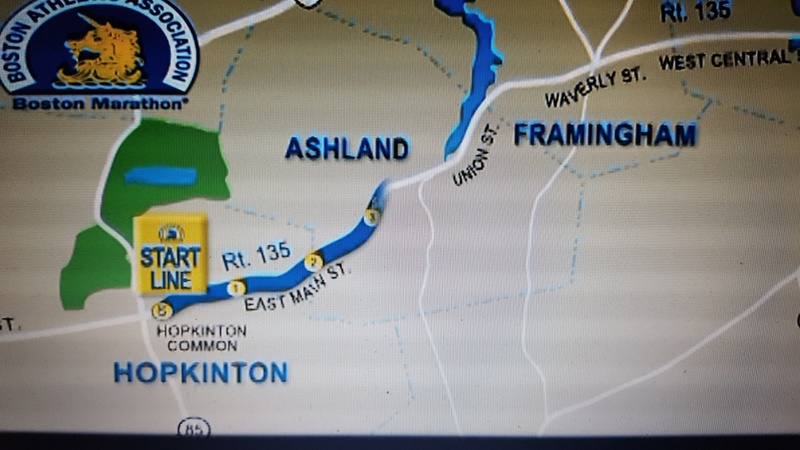 If you're hoping to qualify for the 2017 Boston Marathon, this is a great course for that accomplishment (I ran my 2016 qualifying time in NJ back in 2015). Once again, we wish you the best of luck. If you're aiming for the half, may all of you set strong personal records, and may you eat lots of WindMill cheese fries in spirited celebration. I am happy to announce the official start of the Kiprunning Sports Club. This club is open to competitive-tier runners—both men and women—looking to improve their times. Interested runners should consult the Sports Club page on the Coach Kiprunning website for qualifying standards to ensure that they meet the basic requirements for participation. The first official meeting of the Kiprunning Sports Club will be on Saturday morning, April 30, 2016, at 7:45 am. Runners should meet at Georgetown Running Company, which is located at 3401 M Street NW, Washington DC, 20007. Additional workouts will be assigned and organized on an ongoing basis as the club takes shape. To join, visit the Services page of Coach Kiprunning, and complete, and submit, the questionnaire and waiver forms at the bottom of the page. Once I receive and review your information, I will call you to discuss participation requirements and membership dues. If you have questions in the meantime, feel free to contact me. Also, I encourage you to check the Sports Club page on this blog for ongoing updates and information. I will look forward to working with you. 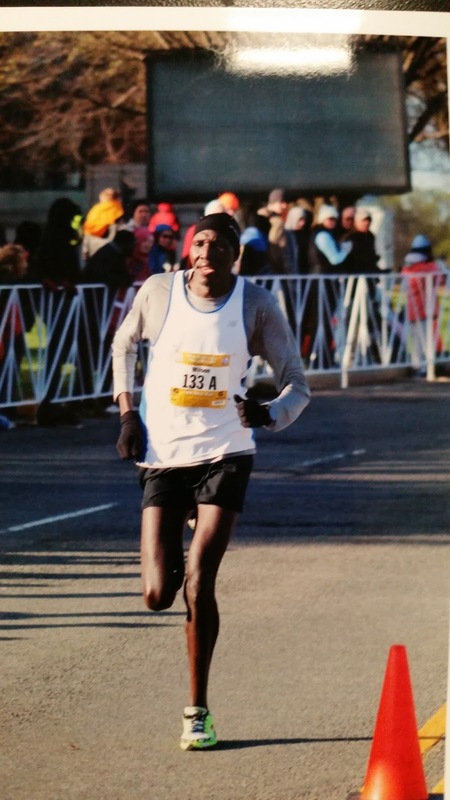 RunWashington published a full list of the DC-area runners who competed in this past Monday's 120th running of the Boston Marathon. Give it a read. Congratulations to everyone who ran on Monday--DC-based and non-DC-based alike! It goes without saying that the Boston marathon is legendary. It is one of the toughest, but best, marathons in the world. I have had the good fortune to run it three times. Each experience was different and intense. There are three core variables that determine a successful marathon: a good training plan, good nutrition, and the weather. The weather is obviously beyond your control. In fact, the weather was almost my undoing the first year I ran the Boston Marathon, in 2004. Many elite athletes did not complete the race that year. The weather was exceedingly hot. 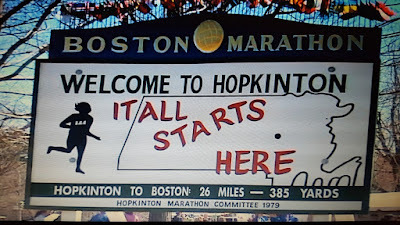 Still, that was the year that I ran my best Boston Marathon. I actually finished 12th place overall (more on all of that later). Therefore, even though the weather is out of your control, and even though it is looking like it might be on the warmer side this coming Monday, there is still a lot that you can do to ensure an excellent performance despite the unknown and unexpected factors that can arise in any road race. 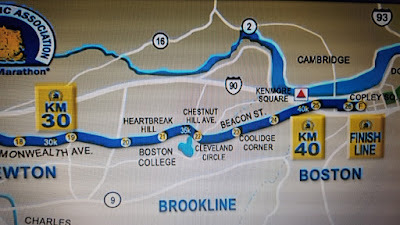 Here are some basic tips to help Boston Marathoners new and seasoned to finish strong and to avoid heartbreak on Heartbreak Hill. About three days before the race, begin increasing your carbohydrate intake. Increase your fluid intake as well. Many runners refer to this period as the “carb load” period. As always, I recommend not altering your diet too much in the time before the race. Continue to eat balanced, healthy meals, but do add extra carbs into your diet. You need to run 26.2 miles, and you need the energy to do that. Carbs will help you there. I offer the same advice with fluid intake: do it gradually, but do not overdo it. If your stomach is sloshing, take a break. Finally, consider eating your last large meal roughly twelve hours before the race. That way, you will digest the food and will experience the benefit of its nutrients while you are running. Keep things light and healthy once you get under that twelve-hour window. 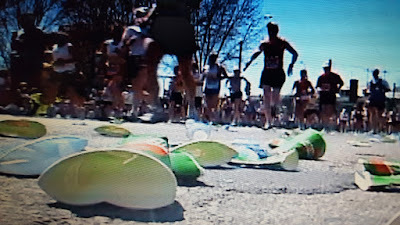 The Boston Marathon, in particular, presents some slight complications with clothing, because it starts somewhat later than other races, and depending on which corral and wave you are in, you might actually start the race close to the time when temperatures will be reaching their peak. 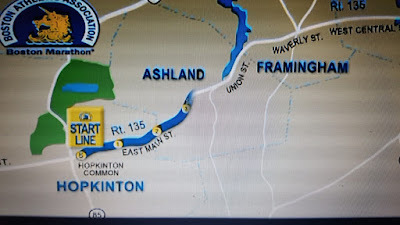 Therefore, dress comfortably and in layers for the early morning conditions, while you are waiting at the start in Hopkinton. Remember that you can always discard layers of clothing during the race. Just don’t toss away your number! But do make sure that you toss your clothing clear off of the course. As always, dress consistently with what has been comfortable during your training. Just remember that you will be running for a long time, so sometimes it is best to dress on the lighter side, even if you are a little cold at the beginning of the race, because you will heat up. Shorts and short sleeves work really well for most conditions. In cooler weather, compression bands can work well to keep your extremities warm. You might also consider a long sleeve shirt. Still not sure? Check out the Runner’s World “What to Wear” tool for additional help. Again, eat and drink with the same consistency that you have during your training. GU gels, Chomps, Sport Beans should be taken at roughly 45-minute intervals during the race. Make sure to hydrate while consuming any energy food. Once again, strike the right balance with your fluid consumption. I recommended drinking about 13.5 to 27 oz. of fluid per hour. 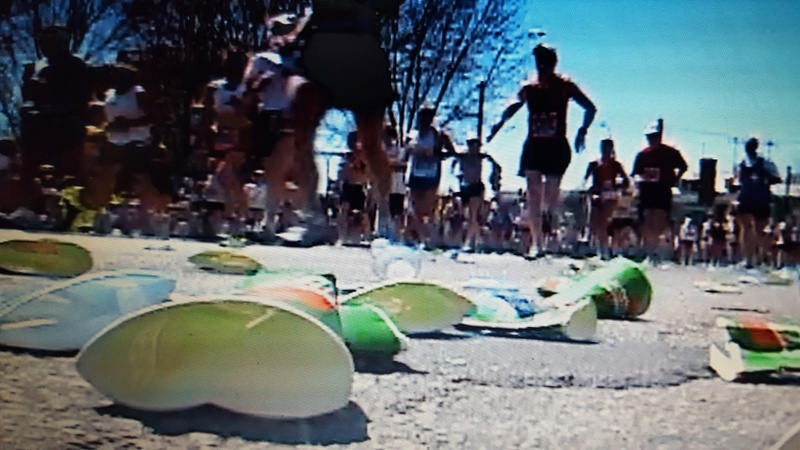 The Boston Marathon has plenty of hydration stations along the course. Plan when and where you will eat and drink before the race. Also, do not wait until you are thirsty to drink. At that point, you will already be risking dehydration. Drink according to your pre-race plan. Do not wait until you are desperate. Finally proceed through each hydration station in a steady, controlled fashion. Make sure that you actually drink the fluid, rather than quickly splashing it onto your face (and, you hope, into your mouth). Proper fueling and hydration will help keep you on pace, even if you drop a second or two when you are receiving it. Seed yourself according to your assigned starting corral. Before entering your corral, jog an easy warm-up for about 10-15 minutes. If there is room—it can get crowded in Hopkington—add some strides to your warm-up routine to get your body acclimated to racing conditions. Remember that a large part of course is downhill, so be prepared for that. Do not go out too fast. Stay easy and steady for the first four miles. Also, try as best you can not to get distracted by the excitement of the crowd. The spectator support on this course is excellent—perhaps the best in the world. Enjoy it, but don’t let it carry you to a very quick early stretch. After the first four miles, the course starts to flatten out. Settle into a gradual, comfortable pace, and focus on simply covering the next nine miles—one at a time—to get yourself to the halfway mark. Keep eating and drinking all along the way. This second chunk of the race remains somewhat flat, with a steady downhill profile and, at mile 16, one slight drop. Stay comfortable and relaxed. The challenging portion of the race comes in Newton, so you do not want to expend too much energy too early. Keep it steady. Once again, enjoy the crowd support, particularly the Wellesley Scream Tunnel. Just don’t get too excited. Stay focused, and remember that you want to finish strong. Hang in the there. You'll be on the streets of Boston soon enough. Heartbreak Hill rises from the course at roughly mile 20.5, following three other uphills between miles 16 and 20. Heartbreak Hill spans about a half mile of the course up to Hammond Street. On its own, the incline is challenging, but what makes this hill especially difficult is the distance you have run up to this point, combined with the three previous inclines that occur late in the race. 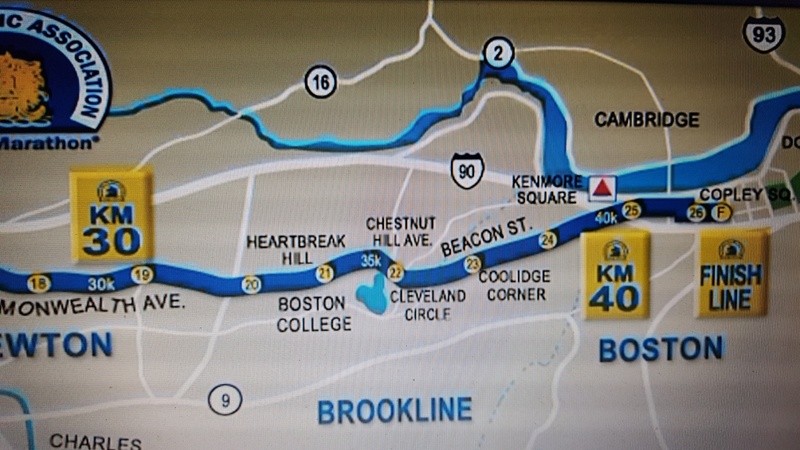 Expect Heartbreak Hill to be challenging. Don’t get nervous, though. Adjust your pace so that you can stay steady and can work the hill. Focus only on this comparably short increment of distance, and don’t worry about the rest of the race. Once you reach the top of the hill, the city of Boston will come into view, and you can be confident that you will make it to the finish line. Relax as you work your way toward mile 21, and then focus on working the last five miles. Keep eating and drinking. After the 21st mile, the course drops downhill again, all the way to the finish. Now, you can channel the energy of the crowd for a final push. As you make your way toward Kenmore Square, look for the city’s famous Citgo Sign on the horizon. Know that the Red Sox will be playing, and whether you like them or not, you’ll love the crowd support that you’ll get as you make the push to Boylston Street. Know at this point that you will be finishing an elite premier event. Run confidently, and run strong, all the way to the end. 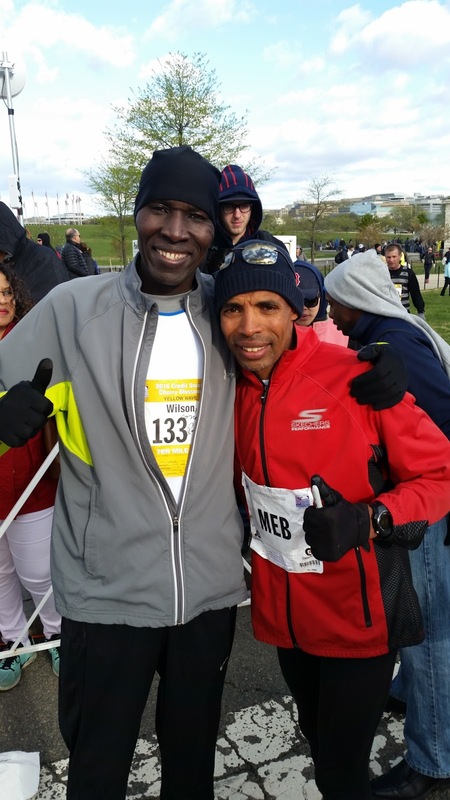 As I was preparing for my ninth Cherry Blossom Ten Miler race, early in the morning on Sunday, April 3, 2016, I was getting ready for difficult conditions. It was very windy and very cold on that day. In many ways, the Cherry Blossom is my home race; the start at the Washington Monument is only one mile away from my house. Therefore, as always, I jogged to the start as part of my warm-up. Given the unseasonably cold conditions, the race organizers made a series of adjustments to the event itself, including starting all of the runners, including the elite women, at the same time. My goal for the day was simply to enjoy the race, not to strive for a new PR. As runners always do in windy races, I made sure to run large sections of the race in a group, using the other runners as shields against the wind. This is a common strategy that I recommend all runners practice when they are racing. Heading out, the wind was particularly tough on the Memorial Bridge at mile 2. After that point, we did have a small tail wind by the third mile at the Kennedy Center. The rest of the race progressed similarly, with alternating head and tail winds, depending on the direction we were running. At the very least, it was sunny, which helped keep the temperature closer to mild than it would have otherwise been. As I came down the home stretch, I ran into some of my friendly rivals, Philippe Rolly and Michael Wardian. I have been running this race with them since 2004. The two of them, along with an energetic, cheering crowd, gave me a boost of energy, and they all made the race more enjoyable, despite the cold. I finished the race in a time of 55:11, and I was happy with that performance. 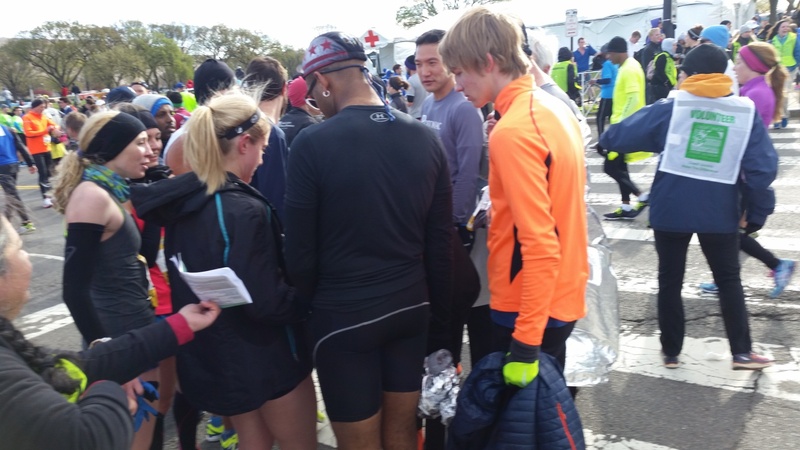 After I crossed the finish line, I briefly chatted with some of my trainees. I also had the opportunity to talk briefly with Meb Keflezighi. He was very generous with his time, spending lots of it signing autographs and posing for pictures with the race finishers. He really is a great guy, and he is a personal inspiration for me and for many other runners. Thank you to all of the spectators who came out in the cold to cheer for us. 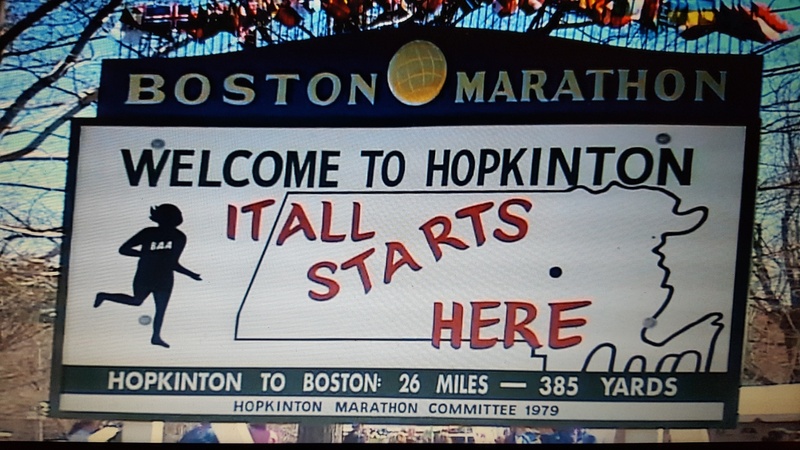 Also, I wish all of the runners who are competing in next week’s Boston marathon good luck. When you are starting your training as a beginner, it is not necessary to worry about how many miles you are running. Instead, focus on the number of minutes that you are running. Gradually, you will begin to cover more distance in the same amount of time, and that is the point when you will want to increase the duration of your workout. As you slowly increase the duration of time that you are running, you will increase the distance that you are running as well. As you begin your training, be sure to arrange your schedule so that you set aside focused time to devote to your running routine. If you have more free time in the morning, run in the morning. If your life is more flexible in the evening, run in the evening. Or run in the afternoon! Just make sure that your workout time will be reasonably free of interruptions or distractions. When you begin your daily runs, do not start too fast too soon. Start out slowly so that you give your body time to warm up. As that happens, your pace will increase. A good beginning threshold is to run for about 20 minutes, which will likely amount to 1-3 miles of distance, three times a week. If at any point, the distance you are running feels too long, do not be afraid to take walk breaks. To maintain a workout that will lead to greater strength and endurance, do limit your walk breaks to 2 minutes. A common guide is to run for 8 minutes and to walk for 2. This routine will get you accustomed to thinking about your early workouts in 10-minute segments. As you get stronger, gradually eliminate the walk breaks. You can also gradually increase the amount of time you are running and the number of days that you run. However, do not increase either until you feel comfortable completing your current level of training. A popular measure of overall comfort is what runners call “conversation pace.” If you can run and carry on a conversation--with a training partner or, yes, yourself--then your overall fitness at your current level is good, and you can consider increasing the duration of your workouts. Establishing a baseline level of fitness with these early runs will take roughly 2-4 weeks, depending on your overall fitness and the consistency with which you run. After you get acclimated at the beginning level, you can plan to increase the duration of your workouts by 3-5 minutes. At that stage, simply follow the same slow build process as when you started. From there, as you approach the 30-minute mark, you will start progressing out of the beginner's stage and will be moving into the intermediate phase of your training, which will require a slightly different approach (that I will discuss in due time). You might even start targeting 5K road races to get the feel of the racing experience. If road racing is your goal, I am here to help you. Feel free to contact me if you want to train for a particular race. No matter what, run steady, and have fun. It is April 2016, and I am gearing up for my 9th Cherry Blossom Ten Miler on this Sunday, April 3. I am as excited about this race as I was when I finished my first Cherry Blossom event in 2004. This race is one of the best ten milers in the United States. With this blog post, I am offering a brief overview of my history with this race, some lessons that I’ve learned along the way, and some tips for running your best ten miler. 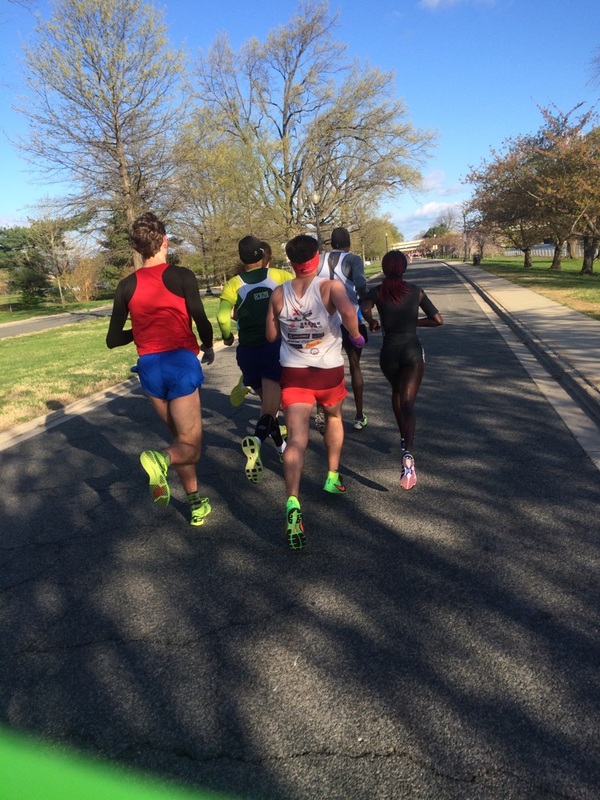 When I ran my first Cherry Blossom Ten Miler as an elite athlete, I was focused solely on my time and staying with the top runners. I achieved my personal best in 2006, when I placed 5th in the field, finishing with a time of 47:58. The Cherry Blossom Ten Miler is always extremely competitive, because it draws top athletes from around the world, making it an energetic and inspiring event for all runners. The distance and timing of the race make it ideal for runners who are looking for a tune-up race, or who are preparing for the Boston Marathon or other spring marathons and road races. Since my first race, I have grown to love the Cherry Blossom Ten Miler more and more every year, because the race brings together a large, supportive community of runners at every ability level. -Race Preparation:Train,and train well. Review the course. Stay hydrated, and eat well throughout your training. The night before the race, I recommend that you revisit the course map so that you can visualize the mile markers and the hydration stations. You should also plan the times at which you will consume additional electrolytes—GU, Chomps, etc.—prior to getting to the start line. Always begin your race with a clear plan and strategy in mind. 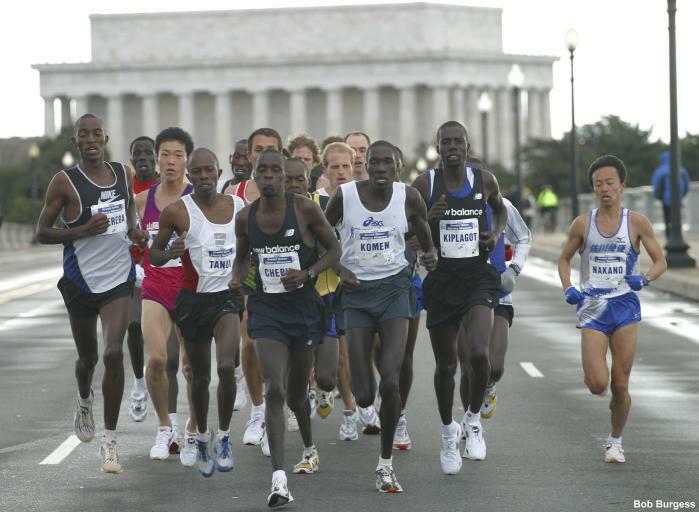 -Race Day: The Cherry Blossom Ten Miler course is flat and fast. 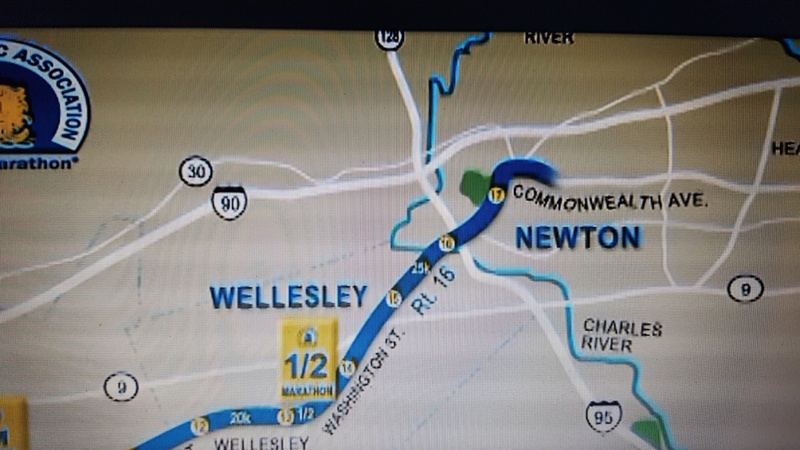 The only significant turn is at the tip of Hains Point between miles 7 and 8. The only significant hill (there are some really tiny bumps throughout the course) comes as you leave Hains Point and approach the finish, after mile 9. Make sure that you do not go out too fast at the start. Stay steady for the first few miles, and consider increasing your pace after the sharp turnaround at the Kennedy Center, right at mile 3. Keep it steady for the next 2-3 miles, and consider increasing your pace even more as you run under the Potomac River bridges and approach mile 6. As you leave Hains Point and begin the climb up the hill toward the finish line, focus on the sensation of finishing the race—the pride and sense of accomplishment you will feel. Don’t worry about the hill. Stay steady and strong, and remain in control of your pace. Finish strong and confidently. Final Tip: enjoy yourself. This ten-miler course is great. It is beautifully lined with DC’s famous Cherry Blossom trees, and there are lots of spectators who provide runner support. Good luck to everyone running this year’s Cherry Blossom Ten Miler. I’ll be down there with you tomorrow, and I’ll give you an update about my run next week.